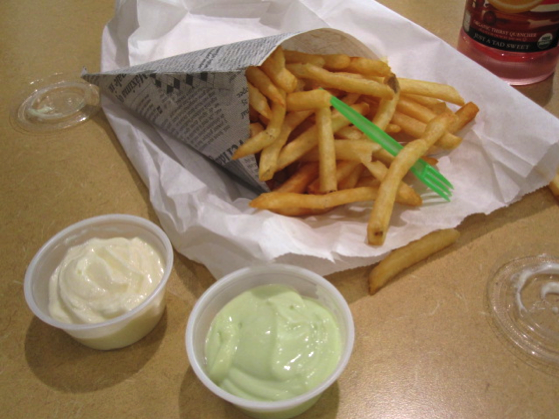 I shared Double Fried Belgian Style Frites from the Frites 'N' Meats truck with Andrea today. It was an awkward and borderline creepy experience. When I asked for two sauces, the man said something to the tune of "anything for you honey." This is an example of a generally flattering expression turned somehow weird as a response to a sauce request. (See: Freaks 'N' Frites 'N' Meats) We brought it back to the office kitchen only to find that the fries were skinny and lukewarm. We got the wasabi mayo and the garlic aioli. The wasabi mayo was not spicy and but the garlic aioli was decent. The fake newspaper fry holder was kind of tacky. Less tacky idea: real newspaper. I was hoping for some legit frites, but all in all I'm sad to say these were not worth the calories. Maybe their burgers are more exciting; I'll never know.